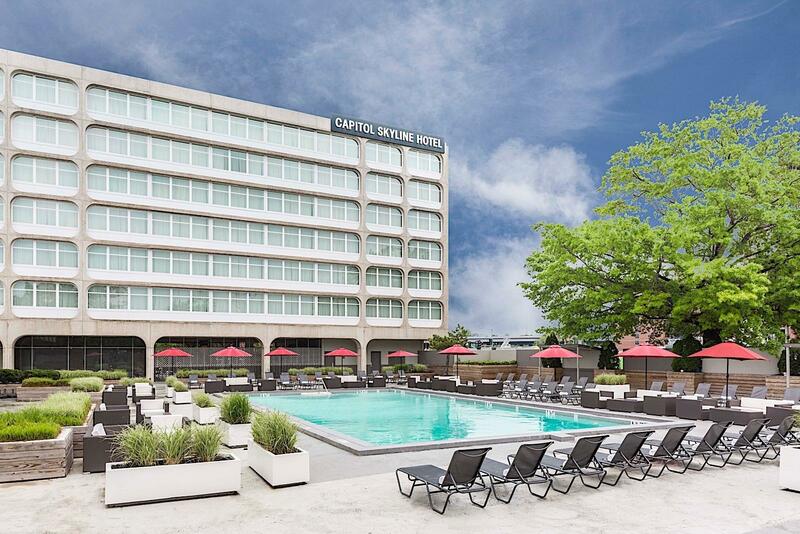 Each summer, the Capitol Skyline pool transforms into relaxed and "chill" environment with cool house music, cabanas (available on a first come, first served basis) stylish pool furniture and family-oriented holiday weekend events. For questions regarding the pool and pool membership, please contact us directly. Please note that the pool is currently closed for the season. Pool rules have been established so that everyone may enjoy the pool in safety and comfort. If you have any questions about their intent or enforcement, please contact the lifeguard or the General Manager. The hotel maintains a staff whose responsibility is to ensure and enhance our safe enjoyment of our facility. You retain responsibility and liability for any accident or injury you cause or incur in connection with your use of our facility; your entry to pool property constitutes your agreement to release the hotel and pool management, it’s agents and employee’s and to hold them harmless from any liability for any accident or personal injury and/ or sustained loss or damage to life, limb or property. Similarly, the hotel and pool management will not assume responsibility for loss of any personal items you might bring on the pool premises. Pool Membership passes must be presented. All children must be accompanied by an adult and under adult supervision. Lifeguard duties include monitoring a safe swimming environment for all and cannot be expected to babysit or watch your children. Swim attire is required for entry into the pool. Cutoff jeans are not permitted. If you cannot wear a regular bathing suit due to medical reasons, please consult with the lifeguard. All babies and toddlers must wear commercial swim diapers while in our pool. To protect the health of all, we will deny swimming privileges to anyone with a cold, cough, inflamed eyes, infection, bandage or open wound. All electronics such as radio, CD player, iPods, etc. must be kept at a level that will not be heard beyond your immediate vicinity. If another patron asks you to lower the volume, please comply politely. We encourage the use of headphones. We do supply our house music system for your enjoyment. NO FOOD OR BEVERAGE is allowed at the pool. You can purchase items from the hotel gift shop. These items will be allowed. The Food and Beverage hours of operation will be posted by early April 2019. **The hotel reserves the right to revoke any memberships should the hotel feel it necessary. While we have made every effort to increase the number of chairs, reserving chaise lounges or chairs is not permitted. We strictly enforce this policy. Floats, Rafts and other floatation devices are not allowed except in the case of it being used for children under the age of 3. It is up to the discretion of the lifeguard to determine if the float is allowed in all cases. Private or Group swim lessons will not be offered or allowed due to space availability in the pool. No rough housing, diving, running, pushing or dangerous conduct at the pool. This behavior warrants removal from the pool for the day or for the season without refund. All children need to be relatively close to their parents. The pool deck is utilized by members and hotel guests. It is important that children are not running around and throwing items back and forth possibly disturbing guests relaxing. Periodic breaks may or may not be imposed at the discretion of the lifeguard. It is solely up to the lifeguard as to when he takes his break, limiting it to only 15 minutes every hour. Let the sun and fun begin! Pool is open daily from “Memorial Day Weekend” to “Labor Day Weekend” from 8:00 am to 10:00 pm. For the safety of our guests, management reserves the right to close the pool operation during inclement weather conditions. Parking will be offered to members for $5.00/day. Day passes at $45 (+ tax) per person available during weekday use. 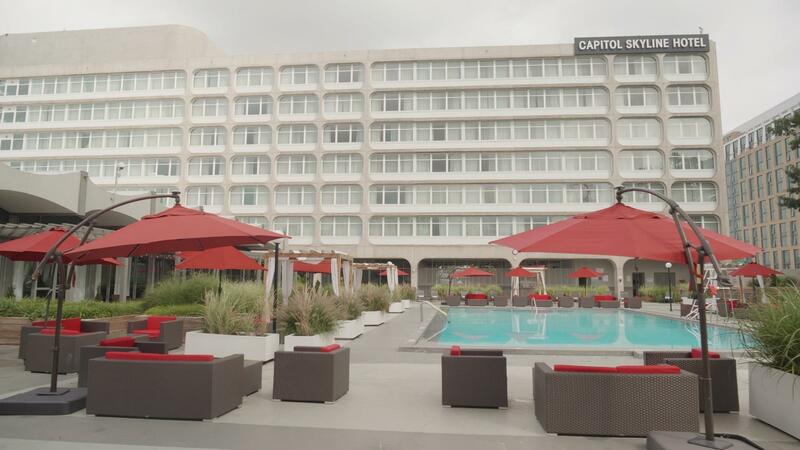 CABANAS will be available on a first come first serve basis. *Parents with children age two and under may purchase a couples’ pass. Memberships cannot be shared amongst individuals who are not residing in the same household. Proof of residency may be requested. Memberships can be paid by cash, credit card or check. Should you be paying with check, please allow up to 10 business days to process the check. Payments can be mailed to 10 “I” St. SW, Washington, DC 20024. ATTN: Pool Members. You can fill out the credit card authorization form, scan and email it. You can also just stop by the hotel and pay directly at the front desk. Membership cards can be picked up starting, May 26th at the hotel. **MEMBERSHIPS CARDS ARE NOT MAILED. CHILDREN'S PARTIES: We will have children's birthday parties again this year for pool members. We are currently in the process of creating a children's menu. Parties will have a designated area. Due to space, we ask that the parties do not exceed a total of 30 guests (children and adults). A designated area will be setup for your event. In the past, most events began at 10 am with food being served at 12 noon. The party should not go beyond 2 pm. A cake or cupcakes may be brought in. Cost for the party is $25.00 per person plus applicable service charge and taxes. Day passes at $45 + tax per person available during weekday use.